EFNC dryer cooler, allows efficient drying and cooling of products, with high energy savings. 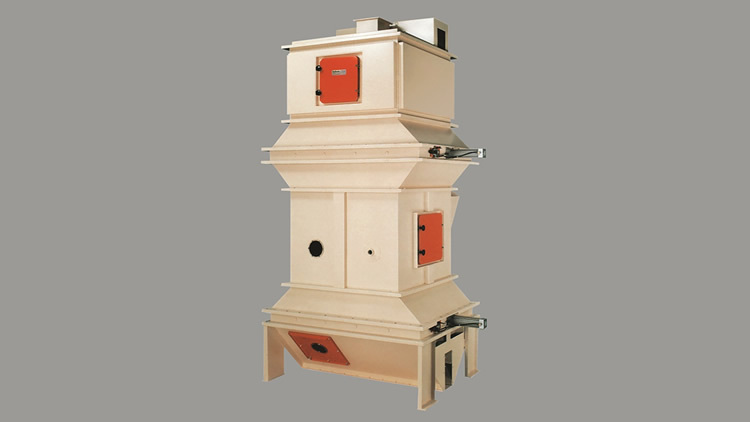 The cooler acts by countercurrent with the use of the temperature that has the grain, it is achieved that the drying continues in the cooling sector, thereby achieving a saving of energy used in the drying. The unloading system achieves a homogeneous lowering of the product and a complete emptying, guaranteeing a hygienic process. Both sections, dryer and cooler, have a sliding discharge system mounted on bearings. Minimal condensation in the pipes and in the cyclone, thanks to the fact that the aspiration of the dryer and the cooler is unified.